Backsolve, or figure out a much more difficult way to solve these backsolve problems. It’s important to be ever-cognizant of the fact that on a multiple choice test, one of the 5 answers has to be right. Because of this, it’s sometimes possible to answer a question correctly by starting at the end, and ending at the start. 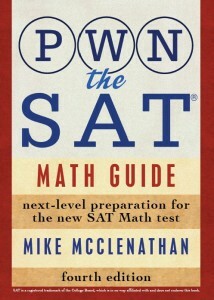 Most in the prep world call this “backsolving,” and it’s even more powerful on the SAT because the SAT will always put numerical answer choices in order, making it even easier for us to do this efficiently. Pattern recognition, folks: it’s super important. Anyway, let’s have a look at a backsolve example. The setup for this question comes from a contest winner; I apologize in advance if it’s too macabre (or just plain weird) for you. Rex is a dinosaur who eats kids who eat nothing but corn. He eats 1/4 of the kids on his island on Monday, 13 kids on Tuesday, and half as many as he ate on Monday on Wednesday. If there are 22 kids left on the island on Thursday, and no kids came to the island or left in a way other than being eaten in that time period, how many kids were on the island before Rex’s rampage? Instead of trying to write an equation to solve this, let’s use the fact that one of the 5 answers has to be right to our advantage. If we start with answer (C), we’ll have to try 3 answers in the worst case scenario, since (C) is in the middle and if it’s not right we’ll know right away whether we need to go higher or lower. I’m going to set up a table to keep track of what’s going on, but when you do this on your test you certainly don’t need to set up a table. You just need to pick an answer choice to start with — almost always (C) — and follow the instructions in the question to see whether everything is internally consistent. Alright. Nice. We’ve successfully summarized a gruesome scene with a neat and tidy table. Success! If the answer choices are numbers (that go in order — they always will), there’s a good chance you can backsolve. If the question is a word problem, your chances get even better. Practice, of course, will make this easier and easier. As with any new technique, you’ll want to make sure it’s second nature for you, even on hard questions, before you sit down for the real test. So practice backsolving on hard questions now, and reap the benefits on test day. It’s rare to find a test that doesn’t have at least a few good backsolves on it. No more dinosaurs eating children (probably)! For more tough backsolve problems, try this and also the last question here. 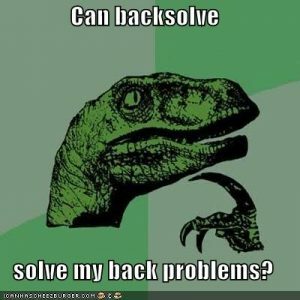 For even more, browse the “backsolve” tag on my Tumblr for some recently posted examples! please help me with #19!!!! Sure! Start by assuming (C), which says that 19 perform both tasks. If 19 perform both, then 45-19=26 only grow broccoli, and 30-19=11 only hunt. That makes the total number of people who only perform ONE task 26+11=37, which is what the question said. DONE! This kind of question is especially tricky without backsolve. The easiest trap to fall into is to add the number of people who grow broccoli to the number of people who hunt and subtract the number of people who only do one task: 45+30-37=38. But what happened there is that you counted the people who do both tasks twice! In other words, there aren’t 75 people on the island. I think I found a “sort of” trick. What I figured out is that you can obtain the correct answer by adding 45 and 30 and getting 75. Then, subtracting “those who do only one task,” which is 38 and dividing that by 2, you can get 19—the correct answer. Same with #13 on Math Drill #3. 86 + 57 is 143. 143 – 83 is 60. 60 divided by 2 is 30. I am not sure how or why it works, but it just does. Note, however, that this only works when you need to find “those who do only one task” or “those who do both tasks”—this will never give you the answer for a total amount. Clever! This works because when you do 45 + 30, you’re double-counting the people who do both tasks. Can you give me an explanation to this student produced response? A group of 20 children is waiting for the school bus. Each child is wearing either a hat, a scarf, or bot. If 10 of the children are wearing hats and 16 of the children are wearing scarves, how many of the children are wearing hats but no scarves? The answer is 4; how do you get it? Everyone’s wearing a hat, a scarf, or both. Which means if you’re NOT wearing a scarf, then you’re wearing a hat. Since there are 20 kids out there, and 16 of them are wearing scarves, that means 4 are not wearing scarves. Those 4 must be wearing hats. oh WOW! It’s that easy! I was really confused by the overlap of kids wearing both. Thank you! The question asks how many are wearing hats only, not how many are wearing both. I don’t see how you arrived at the answer A for 13. An explanation would be really appreciated! This question is in my book, too. Here’s an image of the notes that accompany it there. This is a fun backsolve. Here’s how I set it up in my book. $13 × 7 + $9 × 8 = $163. That’s way too much–tickets must have been cheaper. $11 × 7 + $7 × 8 = $133. Still too much! Make tickets even cheaper. Try (E). If it costs $5 to go to Waconia, then it costs $9 to go to Chaska. $9 × 7 + $5 × 8 = $103. That’s what we’re looking for! (E) is the answer. You can also do 2 equations. Plug in c and get w, which also equals 5 (the right answer). See this comment on the Drill 2 page…does that help? For number 13, could you show me how you would solve it algebraically, just in case it comes up in the student produced questions. You’d have to set up a system of equations. Say x = number of hats and y = number of scarves. Hey, could you please explain how you solved #13 on Math Drill #3? I can’t seem to get the correct answer even though I understand #19, above. Thank you in advance. It’s a really similar problem. Start by trying (C). If there are 36 people with both features, then there are 86 – 36 = 50 with only king beds and 57 – 36 = 21 with bathtubs. That’s a total of 50 + 21 = 71 people with only one feature, which is too few. So it must be the case that fewer people have both, so that more people can have only one. So try (D). If 30 people have both features, then you’ve got 86 – 30 = 56 with only king beds and 57 – 30 = 27 with bathtubs. That’s 56 + 27 = 83 people with only one feature, which is right on the money. if using this method, and all conditions are met, you only need to backsolve 2 of the answer choices. If you start at C and determine is has to be smaller, you can then solve for A. If that’s wrong, then B must be the right answer. Of course, I recommend you still check B for correctness if you have the time, but in a dire situation, it’s nice to know you only have to backsolve 2. Personal side note: If you can quickly come up with the mathematical relationships (the complicated part), it might be easier just to solve the problem algebraically. If not, backsolving is a great way to go about it. It just seemed like a better way to solve it. So, on the test, should I try this sort of method first or go with your backsolving method, which is probably safer in the grand scheme? That’s very good. If you can write the equations and are certain of them, then they’re a totally legit way to solve a problem. To be sure, that’s exactly how your math teacher in school would tell you to solve this one!